The supermarket is the last of the 'Big Four' to see its sales hit by the rise of Aldi and Lidl. Asda has hit out at its ‘desperate’ rivals, comparing Morrisons’ voucher scheme to quantitative easing, after reporting sales had fallen for the first time since 2010. Having managed to battle onwards and upwards in the supermarket price war thus far, Walmart’s UK arm is not going down without a fight. Sales fell 1.6% on a like-for-like basis in the 13 weeks to September 30th (or a ‘step back’, as their press office decided to label it), compared to a small rise of 0.6% in its second quarter. Not fantastic news, but a darn sight better than its ‘Big Four’ rivals’ most recent results. Morrisons’ third quarter sales slumped 6.3%, while Tesco and Sainsbury’s half-year revenues fell 4.4% and 2.1% respectively. 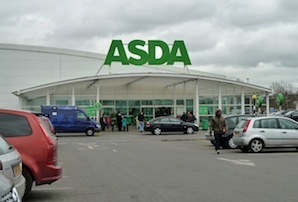 Asda, meanwhile, said it had also managed to increase its market share of late – albeit by just 0.1% to 17.3% in quarter (a figure corroborated last month by researchers Kantar). Its online sales also surged 19.6%. ‘These are desperate measures,’ Barry Williams, Asda’s chief merchandising officer for food, said of the £5 fruit and veg vouchers Morrisons have been giving away in The Sun. ‘In my 25 years in the industry I have never seen vouchers like these,’ he added, telling reporters that Bank of England governor Mervyn King, who dreamt up quantitative easing, was alive and well in Bradford. Said strategy was firing the shot that started the price war a year ago, by committing £1bn to lowering prices over the next five years in a bid to counter the inexorable rise of German discounters Aldi and Lidl. Morrisons has attempted to outdo it by pledging £1bn over the next three years, with little to show for it so far. Philip Clarke put £200m into price cuts back in February, which did nothing to save Tesco's sales or his career. Sainsbury’s, meanwhile, put just £150m towards lowering prices on Wednesday. Asda’s strategy, then, is paying off in that it’s doing less badly than the other big supermarkets. But these latest results are proof it’s not exactly doing well either.